Elizabethtown Junior Woman’s club officers for 2014 are from left, Past President Leanna Milby, Treasurer Shelley Bracket, Assistant Treasurer Michelle Nevitt, Membership Chair Leslie Steiner, Social Chair Jacinta Perkins, Vice President Eileen Townsend, and President Andrea Pelley. 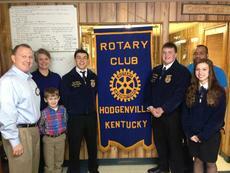 Jason Hodge from the Kentucky Department of Agriculture was the guest speaker at last week’s meeting of the Hodgenville Rotary Club. 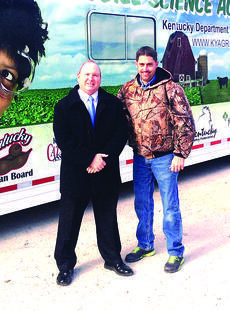 He and Rotarian DeWayne Murray are standing in front of the Mobile Science Center trailer, one of two constructed last year as part of an initiative to involve children with agricultural science and learning. The 4-H Council will meet 6:30 p.m. Feb. 3 at the LaRue County Extension office. The 4-H Wranglers Horse Club will meet 7 p.m. Feb. 4 at the Extension office. The 4-H Cloverbuds will meet 3:30-4:45 p.m. Feb. 5 at the LaRue County Extension office. The 4-H Rabbit Club will meet 6 p.m. Feb. 5 at the Extension office. 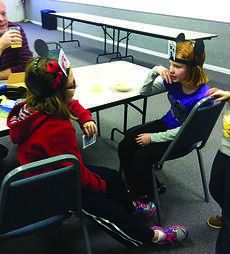 Ashley Miller and Natalie Gentry played a game during the 4-H Cloverbuds meeting last week. Cloverbuds activities are open to LaRue County youth ages 5-8. Contact the LaRue County Extension office at 270-358-3401 for more information, or to sign your child up to participate. 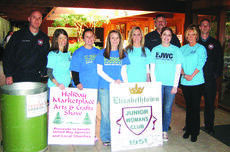 The Elizabethtown Junior Woman’s Club are pictured with members of the Elizabethtown Fire Department at Holiday Marketplace on Nov. 8-9. 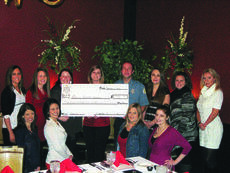 The Elizabethtown Junior Woman’s Club made a donation of $500 to the Elizabethtown Fire Department. 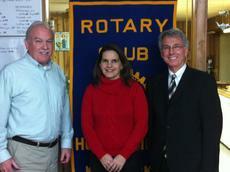 Proceeds were from Holiday Marketplace. Several of the women are LaRue County natives.